Interpreters are a versatile bunch. If you don’t believe me, just skim the transcripts of the recent Interpreting Journal Chat on Twitter that looked at how interpreters juggle their different professional profiles. During the chat (aptly titled “How many hats do you wear?”), we saw that freelance interpreters may also be translators, voice talents, entrepreneurs, business consultants, community managers, “fixers”, and much more. My own set of headwear is not all that diverse by comparison, as most of it relates to the practice of conference interpreting and the training of the next generation. But I recently added a new hat to the collection, and that is what I’d like to talk about to you today. If you follow the Diaries on Facebook and Twitter, it’s likely you will already know what I am going to discuss today. Readers who follow my blog through a subscription or feed only, or who are not overly active on the social networks, might be wondering why I’ve suddenly decided to leapfrog over the remaining training-related issues and start in on the topic of market entry for graduates. Let me assure you, there is method to my apparent madness. I’m doing this because there is an event coming up which I believe will be of great interest to the Diaries’ readers, many of whom are either aspiring interpreters or graduates starting out in the profession. I’m referring to the upcoming session of the Interpreter Journal Club that will focus on advice to newly graduated interpreters. If you haven’t yet heard of the Interpreter Journal Club, let me explain that it is a global initiative bringing together interpreters of all stripes to talk about the issues that affect us. This live (i.e. real-time) chat takes places on a fortnightly basis, and is run on Twitter, the technology par excellence for facilitating global conversation. The chat, which is identified on Twitter using the hashtag #IntJC, has been running since September, with sessions held on alternate Saturdays, and has already developed a loyal following among the global online interpreting community – although there is always room for more participants! 1) Read the article that has been chosen for the session. 2) Take at look at the proposed discussion points (and prepare some replies of your own if you like). 3) Set an alarm to remind you when the chat is about to begin. 4) At the designated time, get online (via a PC or smartphone) and get chatting! If you are already registered on Twitter, then participating in the chat is as easy as logging in at the right time and adding #IntJC to your tweets so they enter the stream. 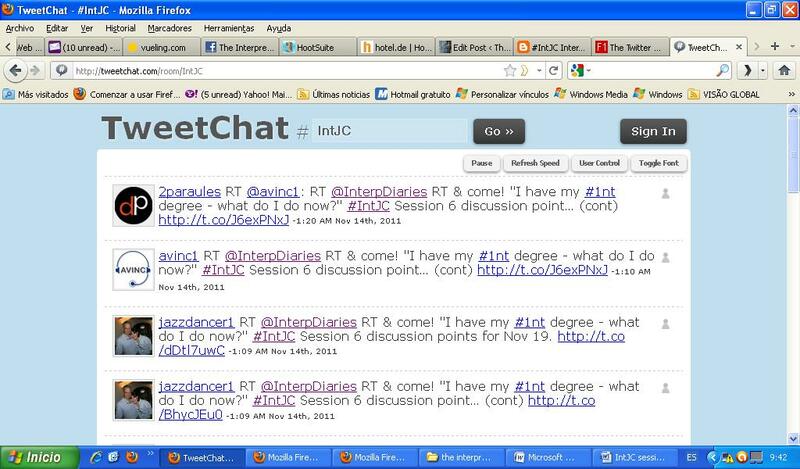 You can also sign in to the #IntJC chatroom on Tweetchat.com if you like, but it’s not necessary. If, for whatever reason, you are not able to follow the live chat at the designated time, then all is not lost – you can always call up the transcripts of the conversation, which are compiled using a service called Chirpstory and are available on the Journal Chat’s website shortly following the conversation. To see the transcripts of past #IntJC chats, click here. As I said earlier, the article that is going to be discussed this Saturday looks at tips for recent interpreting graduates. It is entitled “So I have my conference interpreting degree – what do I do now?” and was written for the Interpreter Training Resources website by Chris de Fortis, Interpreter Trainer and Senior Interpreter at NATO. In the article, the author goes through a number of practical tips and tricks for new interpreters to keep in mind as they start out on their professional career. 1) What did you do (or are currently doing or plan to do) to enter the market after your training? 2) Of the article’s 16 sections, which contain the best advice? And the worst? Were any tips completely new to you? 3) Do you have a Unique Selling Point (USP)? Do you think it’s necessary to have one? 4) What do you think about the author’s comments on markets, competition and rates? 5) What would you prefer: staff or freelance? How about volunteer work? 6) What is your experience with consortia, secretariats, agencies? Any lessons you’d like to share? There are likely to be veteran interpreters participating in the chat, as well as a number of newbies, and I am sure it will be an excellent learning opportunity for all.